Previous research in high rainfall zones or above average seasons has shown that in cases where leaf spot disease levels are high very early, fungicide application at or before first node (Z31) is effective at reducing disease levels and increasing yield in wheat. This trial at Mullewa in 2014 is investigating if the same results will be obtained in lower rainfall environments. Recent trends in cereal production have been towards increasing areas sown to wheat after wheat. 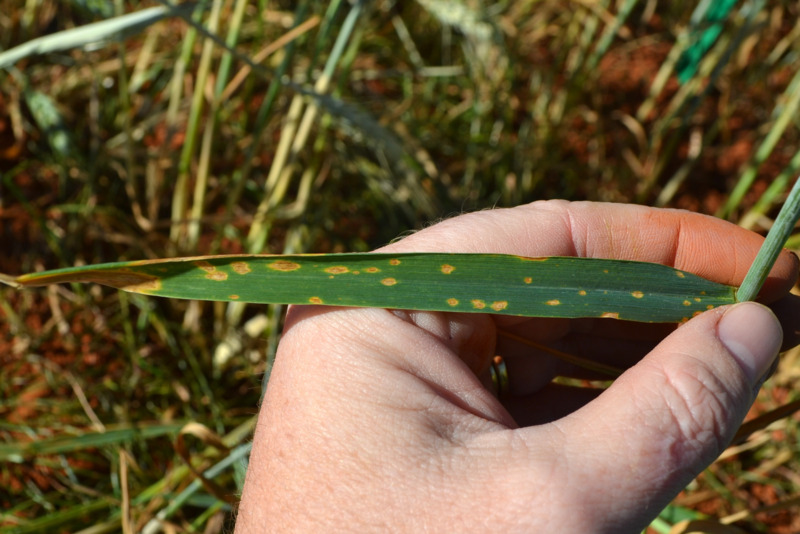 Stubble-borne leaf diseases such as yellow spot are a higher risk in a continuous wheat system. 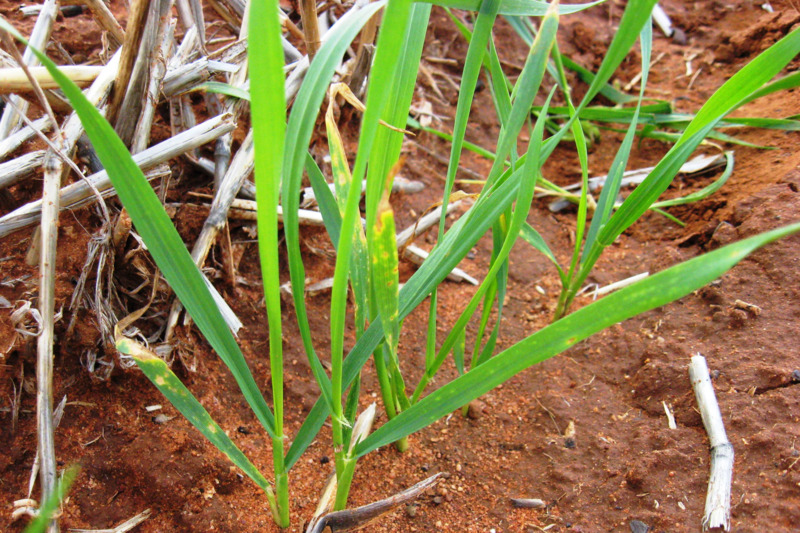 In the past, control strategies for yellow spot have been modelled after the rust diseases with controls aimed at reducing losses in the last stages of crop growth, that is, at or after flag leaf emergence. In wheat on wheat situations in Western Australia, growers are tending to apply foliar fungicides earlier than ever before, applying them at the same time as herbicides at 3-5 leaf stage or early tillering. Previous research in high rainfall zones or above average seasons has shown that in cases where leaf spot disease levels are high very early, fungicide application at these early stages is effective at reducing disease levels and increasing yield. This trial in 2014 will investigate if the same results will be obtained in a lower rainfall environment. To assess the efficacy of foliar fungicide application prior to stem extension for control of yellow spot or septoria (stagonospora) nodorum in wheat in low rainfall zones. Z31 fungicide application applied on 25 June 2014. Treatment 2 received Prosaro® at 300mL/ha, treatment 3 received Prosaro® at 150mL/ha. Septoria nodorum and yellow spot symptoms were present at low levels when trial was established in July at first node on 25 June 2014 with on average 11% disease on the top four leaves. Disease continued but progressed slowly due to lack of rain. Diease assessment on 14 July 2014 (Z39) showed that the plots that had received the Z31 (first node) spray had half the disease levels of the nil (unsprayed) plots - average 7% on top four leaves versus 14% on top four leaves in the nil plots. On 14 August 2014 (Z65, flowering) disease levels were signifiantly lower in fungicide treated plots (Table 2). The trial will be harvested and grain yield, quality results and trial conclusions provided when available. This trial is part of the GRDC funded project DAW00229 Improving growers surveillance, management, epidemiology knowledge and tools to manage crop disease.